1 lb. 5 lb. 10 lb. 55 lb. $1.49 to $47.99 & FREE Shipping on orders over $59 $35. 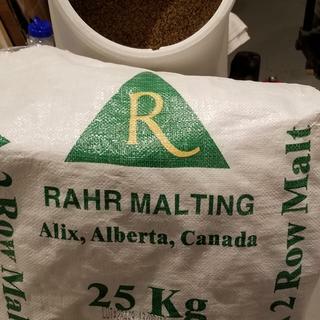 1.9L Rahr - A great base malt from the Northwest made from Harrington and Metcalf barley grown in the USA and malted in Minnesota at the Rahr malt house. Well modified and perfect for single infusion mashes. Clean flavor with a nice, floral aroma with a sweet taste make Rahr 2-row a fast growing malt of choice for many commercial brewers. Try this in your next beer and see the difference. because that's what my recipe calls for..
Great base malt with terrific efficiency. I like big sacks of grain. Local HBS closed down. Seemed like good price for a decent base malt. like having plenty of base around! This is a good malt for a lot of styles. It seems to have a little more than others do. Just used this as a base of a stout. Excellent quality. Hit my SG perfect. Getting good efficiency and great flavor from this base malt! I use this exclusively for as the base malt for all American beers. It’s hands down the best. Just note that it does drop your pH a little more than other American base malts. This is the best quality 2-row for my Homebrew. 55 lbs Rahr 2-Row. The best!